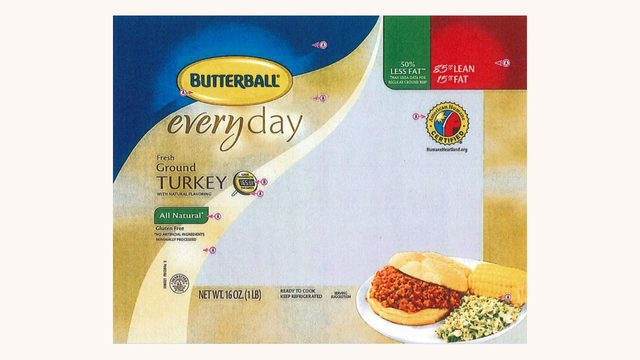 (LAKANA) - (3/14/19) Butterball is recalling more than 78,000 pounds of raw ground turkey over fears that the products may be contaminated with salmonella. The recall was announced Wednesday by the U.S. Department of Agriculture's Food Safety and Inspection Service (FSIS). The products may be contaminated with Salmonella Schwarzengrund, FSIS said in a news release. The potential contamination was discovered by FSIS and several other organizations investigating a multistate outbreak of Salmonella Schwarzengrund illnesses involving five cases from two states. Three intact Butterball brand ground turkey samples were collected from a Wisconsin residence where four of the patients live, FSIS said in the news release. Eating food contaminated with salmonella can cause salmonellosis, one of the most common bacterial foodborne illnesses, according to FSIS. The most common symptoms of salmonellosis are diarrhea, abdominal cramps and fever within 12 to 72 hours of eating the contaminated food. The illness usually lasts four to seven days with most people recovering without treatment. However, older adults, infants and people with weakened immune systems are more likely to develop a severe illness. Any consumers who have purchased some of the recalled turkey are advised to either throw the food away or return it to the place of purchase. Consumers with questions about the recall should call 1-800-288-8372.